Just because someone is turning 60 doesn't mean you can't have a really fun birthday party. Turning 60 is a big achievement. The person has likely been through a lot in life and deserve to celebrate with friends and family. To make a party a success, focus on good food and fun themes and activities for the birthday party of your 60-year-old. The food is often one of the most memorable parts of a birthday party. Dessert is a must and you may want to pick up a cake. If so, consider getting it specially made so that the cake is in the shape of the number "60." If you want something a bit different, create a dessert bar. Cover a small table with cookies, brownies, scones and other sweet treats. Let your guests choose which dessert they want to try. Create an extra special dessert for the person turning 60 so he or she still feels special. Though not mandatory, you may want to provide savory party foods as well. For a large party with a lot of socializing, choose appetizers and finger foods. Small dill pickles wrapped in cream cheese and ham will be a great hit. Create your own dip for chips by combining a can of cheese with a can of chili and warming it in the microwave for two minutes. Since adults like interactivity just as much as children, consider providing a fun sandwich bar. Lay out different kinds of breads, meats, cheeses and fixings so your guests can make their own sandwich creations. Consider the personality of the 60-year-old when choosing a theme for the birthday party. 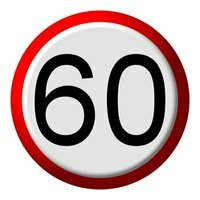 Since this age is an achievement and a special occasion, use the number 60 in your decorations throughout the party. For a more sophisticated theme, decorate the party with objects from the 60-year-old's earlier years. Play music that the person liked when he or she was in high school and wear clothes that were popular during that time. This theme will bring everyone back in time and create a sophisticated yet fun atmosphere. If the 60-year-old has an important interest, such as sports or hunting, you could make this the theme of the birthday party as well. Use this to guide your choices for decorations, activities and food. Although most of the party guests will likely be adults, that doesn't mean you can't have a bit of fun. For a lively bunch, hold a dance contest. This is especially fun for outdoor birthday parties. Appoint one or two people as judges and let everyone dance together to the music of the 60-year-old's youth. Give a prize to the individual or pair who showed the best dancing ability. Bingo is a nice way to add fun to a relaxed, indoor birthday party. Party supply stores sell bingo kits, so you can play the game anywhere. Give away small prizes to those that win each round.